The brave adventurers begin a brand new incredible expedition! 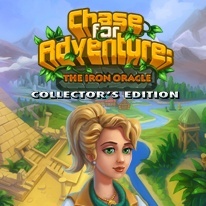 Young archeologist Ann and her adventurer friend, Jim, are leaving for a new expedition to find an ancient device which shall help Ann find her father. They will meet a mysterious Master on their way...shall they become allies or rivals? Enjoy this enthralling time-management strategy game set in an adventure setting now! - This Collector's Edition includes 8 beautiful wallpapers, concept art, hidden morphing objects, a strategy guide, and more! - 45 unique levels to complete!